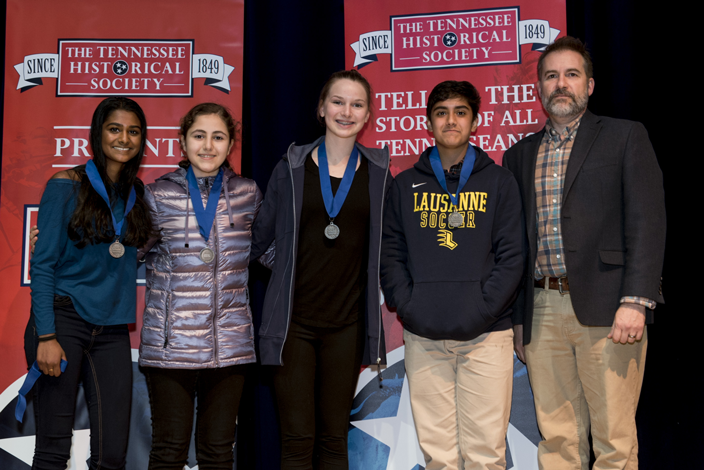 Sixty-two students will represent Tennessee at the National History Day competition this summer. The students are advancing after placing first or second in various categories at Tennessee History Day Saturday, April 7. Participants entered documentaries, exhibits, performances, websites and papers all based on this year’s theme, “Conflict and Compromise in History.” Out of 162 submitted projects, 92 students received medals for their efforts, 15 students were awarded special prizes and two educators were recognized as educators of the year. National History Day will be June 10 through June 14 on the University of Maryland campus in College Park, Maryland, with top finishers earning prestigious awards and scholarships. The Tennessee Historical Society has sponsored Tennessee History Day since 2009 with grant support from the Secretary of State’s office, Humanities Tennessee, the Memorial Foundation and the Community Foundation of Middle Tennessee. For more information, please visit tennesseehistory.org/tennessee-history-day.